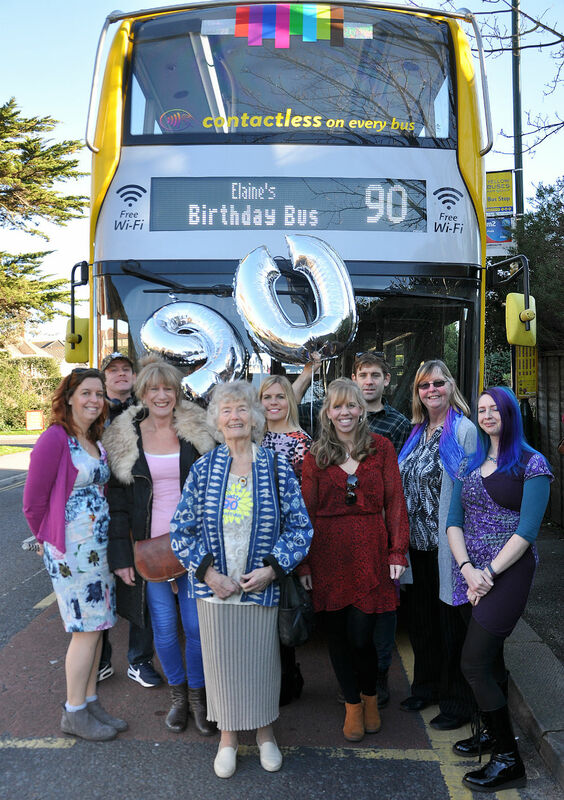 A Bournemouth lady got the surprise of her life when a double decker pulled up at her regular stop with friends and family on board to celebrate her 90th birthday. Elaine Hart, who relies on Yellow Buses was shocked to see the double decker pulling up at her regular stop full of familiar faces. Organised by her daughter Fiona, the bus also picked up dozens more guests at eight stops on its way to Elaine’s surprise party. As she waited outside her home in Southbourne, the bus arrived with ‘Elaine’s Birthday Bus – 90’ written on the front. Somehow, the family and 120 guests had managed to keep the entire thing a secret. Fiona, who was there with her sister Jan, said, “We’re so grateful to Yellow Buses. When dad died in 2004 mum wanted to live somewhere on a bus route. “Yellow Buses have been her lifeline and she goes everywhere on them. She meets up with her grandchildren and it is so handy. Elaine, who had no idea what was planned was overwhelmed by the bus that took everyone to her surprise party at St Saviour’s Church Hall and was amazed at the hour long journey when the bus kept stopping to pick up more family and friends. Friends from the block where Elaine lives, the ex-Wren Association, the Townswomen’s Guild and others who had tall ravelled to be part of the birthday celebration.